14 and still going strong. Chelsea is 14 years old today. She walks a little slower than she used to. I'm not so sure she hears as well. Although she may hear me but doesn't listen any more. But she's still going strong. 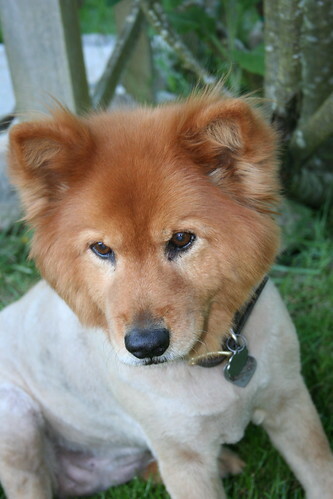 Part chow and part the neighbor's dog, she has always been sweet tempered and a valued family member since she joined us when she was 5-1/2 weeks old. By the way, this picture of her is after her grooming appointment. She prefers a lion cut for her summer do. I know this training facility well. I know the people that work there. I know the owners. I am so sorry to hear that this happened. The heat in Arizona, even inside a building, can be devastating without air conditioning. Eleven people have died in Phoenix this week due to the heat, and now this. Breaks my heart. I have to say this is my favorite time of the year. So it really bugs me that Farley is scared by fireworks. While we were gone at the local Parade, Farley tore through his metal crate and was running loose through the dog room. His stress level when we got home was very high. I didn't put him back in the crate. Instead, I kept him with me and kept going through my daily chores, like taking out the garbage, picking up the house. Even threw a few balls for him. He was sticking pretty close to me just out of fear, so I ignored his stressing and went about life. By the end of the night, when the fireworks were the loudest, he was doing fine. Not entirely calm, but for anyone who knows Farley, this dog doesn't know calm, so as long as his tounge was back in his mouth and he was more like his normal self, I felt like we came along way in overcoming this fear. Or at least surviving it until next year. But I have to give big KUDOS to Miss Tama. This dog is bomb proof. I took her to the parade with us. So that included about 5 miles of walking, being touched by hundreds (and I'm not kidding on the number - HUNDREDS) of people, both adults and children. She not only handled it with her special style of grace and dignity, she actually ate it up. She loves to meet people. I actually had several people walk up to me while we were walking in the Parade and walk down the street with me asking about her and her breed. She is a really special shiba, with an exceptional personality. And a great representative of the breed. She greeted the last person with the same tail wag and shiba smile as she did the very first one. Last year was the first year that I had to deal with fireworks being close enough to my house that it bothered my dogs. Before we had lived in rural Arizona (out with the cactus and the snakes), and other than professional displays, fireworks were not allowed. But here, for a month before Independence Day, fireworks stands dot the landscape like Starbucks in the City. These big behemith shacks full of explosives are packed with people waiting in line to spend money on things they are going to blow up. I understand how fun fireworks can be. They are fun for me to watch, too. But not for dogs. My dogs were scared out of their mind last year. Farley, my aussie, tried to get out of the gate when one of our neighbors sent up one of the whirrling works with the boom at the end. He latched on with his jaws and was shaking the gate. And before I could get out there to save him, he had chomped down on the fence and then pulled backwards and pulled out several of his teeth. This was a dog with full dentition-some of the most beautiful pearly whites I have ever seen in an adult dog. GONE. All that remains are empty sockets. A reminder of our first 4th of July in Washington. So after that, I brought him inside and put him in a crate to calm down. We left for a little while and when I came home, he had destroyed his metal crate in a panic and had a pretty good slice next to his eye. So before you spend alot of money on fireworks, think of your pets, your neighbors pets, the dog down the street. And go enjoy the big professional displays that the communities are putting on. I've heard they are wonderful. I wouldn't personally know. Because instead of enjoying the professional displays, I'll be sitting beside my dogs this year helping them make it through this scary night. I can't believe how many times I hear people say, "putting dogs in a crate is cruel, and I just won't do it". And my response is always to each your own, but don't come asking me how to fix your problems if you won't try my solution. Crating dogs is only cruel if you leave them in there for long periods of time, and allow them to soil in their crate. If you crate train correctly, it is not cruel to the dog, and may relieve your stress at the same time. Before domestication, dogs lived in dens. They used their dens for safety and protection. Naturally they kept their dens clean by soiling outside their living area. Crate training is based on the concept that puppies will do all they can to avoid soiling their living area. 1. When buying a crate, make sure it is the correct size for your dog. For a puppy, an adjustable crate is the best. For an adult dog or a small dog puppy, you should size the crate so they can stand up in it and can turn around easily. If the crate is too big, your puppy may find a corner of it to potty in, and it will make housebreaking more difficult. 2. When you have the puppy and the crate, begin by placing a soft towel in the bottom of the crate for it to sleep on. Make sure that whatever you put in there is washable because no matter how diligent you are about taking a puppy out to potty, there will be accidents. You may also want to put a shirt that you have worn (and that you don’t care that it gets chewed on) in the crate to help comfort the puppy for the first few weeks. 3. Very young puppies need to potty every hour. Under a year old, they do not have full bladder control. To begin teaching them to go outside, set an alarm for every hour and carry them outside to the place you want them to potty. As they are looking for a place to go, use a word or phrase that means “go outside and potty” so they get used to hearing it. When they potty, praise them with a high-pitched voice and play with them with a toy. As the puppy gets older you can stretch this time to an hour, then two hours, then three (if necessary). At night while they are sleeping, you can stretch this 2-3 hours. They puppy will usually tell YOU when they are desperate and need to go. 4. After the puppy has gone potty, it is OK to bring them back in the house to play. Keep a close eye on them for sniffing and any signs that they may need to go back outside. If you can’t supervise the puppy, put it back in its crate. The idea is that you don’t want to give the puppy the opportunity to soil in the house until they absolutely understand that outdoors is the place to go. 5. On the occasions that you can’t take the puppy outside every hour. Never confine your puppy to its crate for more than 3 hours at one time. Like I said earlier, young puppies don’t have strong bladder control and they don’t like soiling their crate. After a year old, it is not uncommon for a dog to be able to go 8 hours between potty breaks, but don’t expect a puppy under a year to be able to do that. 6. Never scold your dog for mistakes, especially in young dogs, it is not their fault. It is the owners fault for not supervising them close enough. And not responding to the clues the dog is giving that it needs to go outside. As an owner, start watching for those clues. Most puppies will want to go outside after they wake up, after they eat, after playing and throughout the day at least every 3 hours. Watch for sniffing, running to the door, and a boost of energy followed by a pause. Always take the puppy outside after eating and sleeping. 2. When you put the puppy in it’s crate and it immediately starts to cry, ignore it. The puppy wants you to come back and let it out. If you break down and run in there, you’ve given in to the puppy and the next time it will cry even louder and longer. Don’t yell at the puppy either. Just go ahead with your daily activities and ignore the cries. Eventually they will stop. 3. If the puppy has been quiet in the crate for awhile and then you hear it crying, it may need to go potty. Try to get to the puppy before it starts crying for very long. Don’t wait it out to see if it will stop. If you do that, then all you’ve done is taught it that if it cries long enough, eventually you’ll come get it. This is especially important at night. Most people don’t want to set an alarm at night to take the puppy outside on a regular basis, so they wait until they hear the puppy crying. The quicker you get to the puppy and get it outside, the quicker you’ll get back to sleep. At night, after the puppy goes potty, it will most likely want to play. You have two choices, play with the puppy (consistent to what you are doing during the day) and wear it out before putting it back in the crate, or putting it back in wide awake and listening to it cry. Either way you’re not going back to sleep until it does! 4. The crate should be the puppy’s house and safety area. The puppy should eventually want to go in there on it’s own when it’s tired and wants to sleep. Never confine a puppy in crate for punishment. And don’t leave it in it’s crate for long periods of time. Puppies need exercise and interaction with your family to become well-rounded dogs.